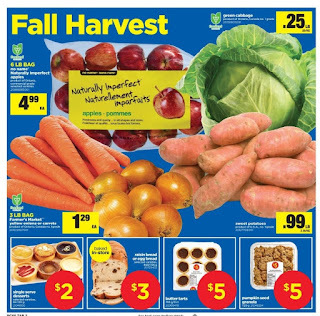 Real Canadian Superstore Winnipeg Flyer Thu Oct 19 – Wed Oct 25, 2017. 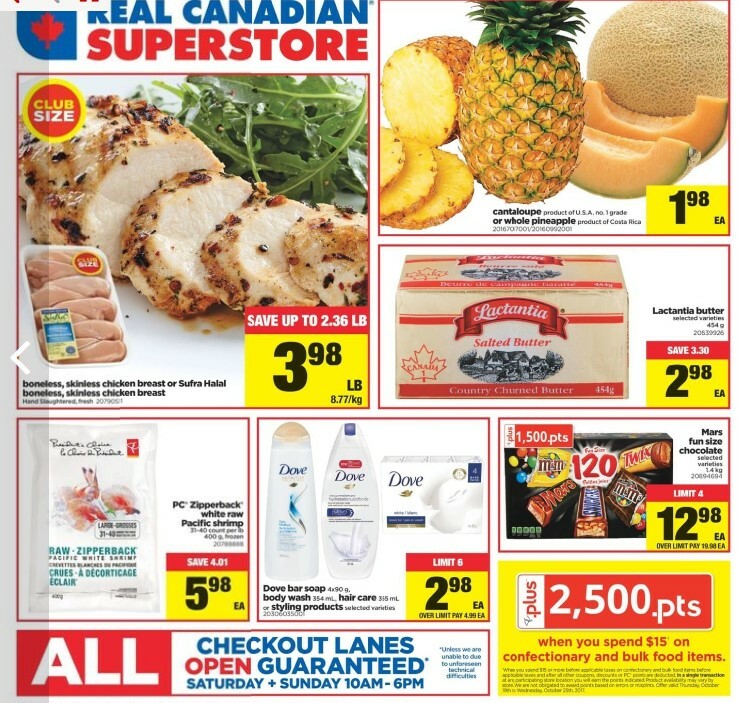 Boneless, Skinless Chicken Breast or Sufra Halal Boneless, Skinless Chicken Breast #:20790511 $3.98/lb Sale Price Up to $2.36 Savings Club size. Hand slaughtered, fresh. $8.77/kg. Cantaloupe or Whole Pineapple #:20167017001/20160992001 $1.98 Sale Price Cantaloupe product of U.S.A. no. 1 grade or whole pineapple product of Costa Rica. 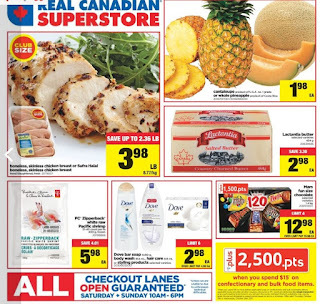 Lactantia Butter #:20639926 $2.98 Sale Price $3.30 Savings Selected varieties 454 g.
PC Zipperback White Raw Pacific Shrimp #:20788888 $5.98 Sale Price $4.01 Savings 31-40 count per lb 400 g, frozen. Dove Bar Soap Body Wash Hair Care or Styling Products #:20306035001 $4.99 Regular Price $2.98 Sale Price Dove bar soap 4 x 90 g, body wash 354 ml, hair care 355 ml or styling products selected varieties. Limit 6. Mars Fun Size Chocolate #:20894694 $19.98 Regular Price $12.98 Sale Price Plus 1.500 pts. Selected varieties 1.4 kg. Limit 4. No Name Naturally Imperfect Apples #:20868985001 $4.99 Sale Price 6 lb bag. Product of Ontario, commercial grade selected varieties. Green Cabbage #:20138805001 $0.25/lb Sale Price Product of Ontario, Canada no. 1 grade. $0.55/kg. Farmer's Market Yellow Onions or Carrots #:20600927001 $1.29 Sale Price 3 lb bag. Product of Ontario, Canada no.1 grade. Sweet Potatoes #:20127708001 $0.99/lb Sale Price Product of U.S.A., no. 1 grade. $2.18/kg. Single Serve Desserts #:21048150 $2.00 Sale Price Selected varieties, 64-120 g.
Raisin Bread or Egg Bread #:20729432 $3.00 Sale Price Baked in-store. 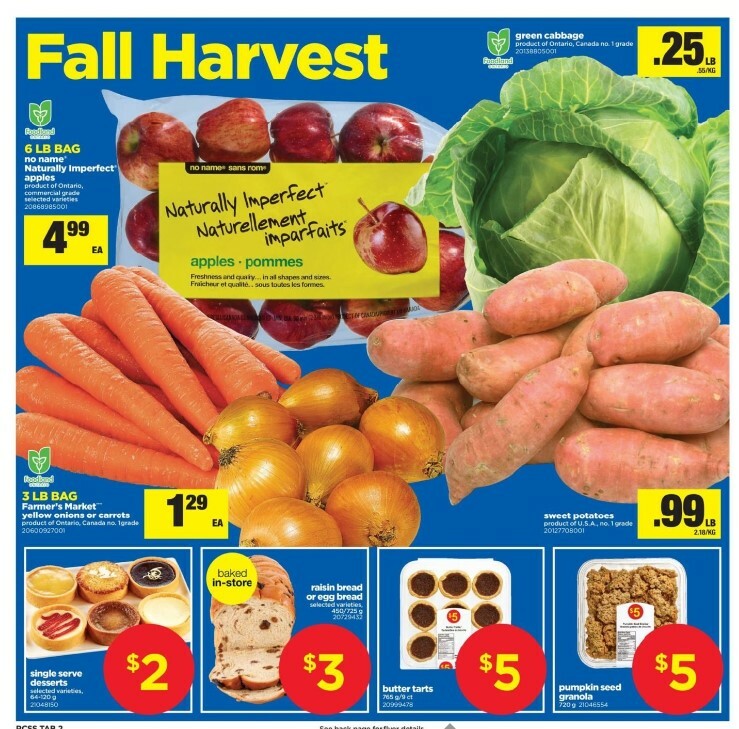 Selected varieties, 450/725 g.
Butter Tarts #:20999478 $5.00 Sale Price 765 g/9 ct.
Pumpkin Seed Granola #:21046554 $5.00 Sale Price 720 g.
Real Canadian Superstore Flyer valid Thu Oct 19 – Wed Oct 25 for details. 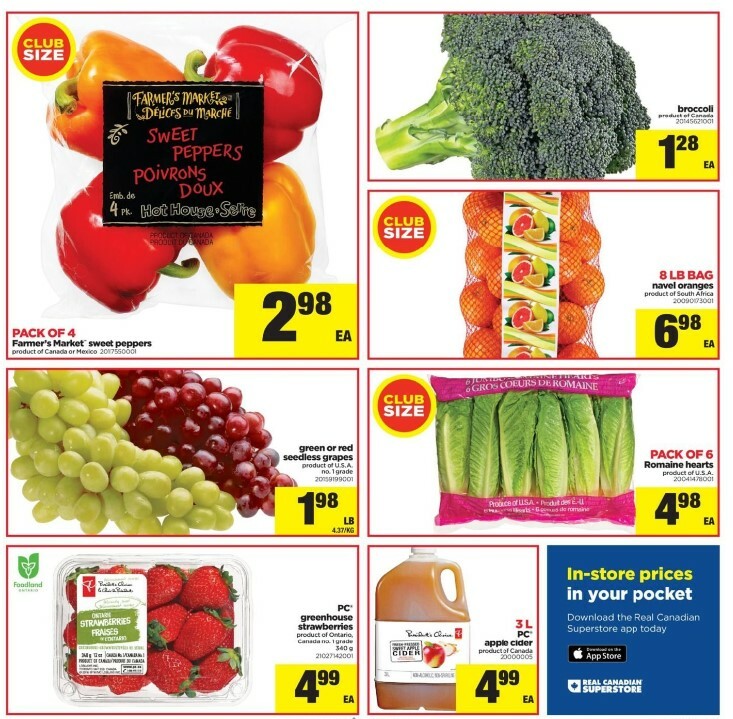 Farmer's Market Sweet Peppers Model #: 20117550001 $2.98 Sale Price Product of Canada or Mexico. Pack of 4. Club size. Broccoli Model #: 20145621001 $1.28 Sale Price Product of Canada. Navel Oranges Model #:20090173001 $6.98 Sale Price Product of South Africa. 8 Lb bag. Club size.